Since the invention of the piano itself, piano tuning has evolved to the point where today, piano tuners have 300 years of history behind them. Since this time, the physics and math of stiff vibrating strings and equal temperament have been mathematically described, leading to a common understanding of the relationship between the notes being tuned. Aided with this information, today's piano tuners are able to consistently tune the wide variety of pianos they are presented with every day. This mathematical understanding has also been used to design "Electronic Tuning Devices" or ETDs. These "Machines" can be programed to provide information to the tuner to precisely predict the proper tuning of each note on a given piano. There are advantages to both using ETDs and aural tuning. It is my belief however that both aural skills and machine tuning can be used to complement each other to obtain the best tunings, but in the end, when the piano tuning is finished, it is the human ear that should and will be the final judge. After all, our machines can aid us in tuning, but they cannot appreciate and enjoy the music we play. I adjust the tension of each string, actually a steel wire, with a tuning lever or "tuning hammer" to achieve a desired musical pitch, and then repeat for each string in the piano, approximately 220 to 240, so all possible combinations of notes played together are musically pleasing. In reality, it's of course not quite that simple. Details such as string and pin setting and soundboard deflection all tend to interact to make the process much more interesting. I'll spare you the details here, but since you've read this far, you may be interested in learning more, and I'd be happy to share it with you at your next tuning visit if you wish. The final result will have all unisons, octaves and other intervals harmoniously complementing and produce the most pleasing tones. Many customers also notice an increase in loudness, presence and clarity from their freshly tuned piano. This is due to the tones positively reinforcing each other when played together. Tuning should be done at least once a year. If this is not done, there is a very good chance your piano's overall pitch will drift, ultimately downward to lower than standard pitch, which is A440. This means that the A above middle C vibrates 440 times every second. The longer you leave the piano untuned, the lower it tends to go. This is due to the extreme high string tension found in all modern pianos made in the last 100 years or so. With the passage of time, the steel strings stretch to a more relaxed tension. Regular tuning not only adjusts the harmonic relationship between the notes, it also adjusts the relationship of the entire instrument to standard pitch and maintains string tensions intended by the designer. 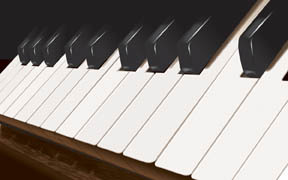 Tuning your piano to standard pitch will also allow you to play in tune with other instruments. If a piano has not been tuned in more than a year, it will probably need a special tuning procedure known as a Pitch Raise or Pitch Adjustment. In many cases, the pitch raise can be done during the same visit as the Fine Tuning. In some extreme cases, I may recommend the pitch raise on the first visit followed by a second visit for the fine tuning. These determinations can only be made after inspecting the piano in person. After you have your piano in tune at A440, regular tuning and proper humidity control will help maintain your piano's tuning and pitch. Installation of a Dampp-Chaser Piano Life Saver System will help to maintain your piano's pitch and help to extend it's useful life.